Trusting your inner wisdom, your intuition, isn't always easy. And like with anything, developing trust takes time. You and your inner wisdom must develop a relationship of sorts. But sometimes the reason why it feels impossible to trust your own insight is that you're approaching understanding your intuition and inner wisdom from a perspective that innately isn't trustworthy. If you ask questions somewhat randomly or sporadically, it's easy to get answers that feel untethered. If you use your inner wisdom - your intuition - like a magic 8 ball, shaking it and asking questions from a place of need, without any other substance, well, that’s going to be pretty hard to trust. In this episode, I’m talking about trust. 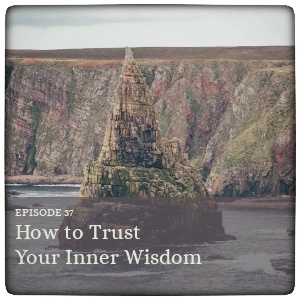 How to create trust with your inner wisdom. How we often use our intuition like a magic 8 ball, which is not how it works. Why the questions we ask our inner wisdom - and how we do that - leave us feeling unsure of the answers. How to create a stronger foundation of information that you can trust. How you can create a relationship with your inner wisdom and intuition that feels true and trustworthy. One simple daily exercise you can do with your inner wisdom to create a stronger sense of trust with it.